Planning your dream retirement can be an exciting time. The chance to travel overseas or around Australia without having to rush back to work, time to pursue new hobbies, learn a language or spend time with the grandkids. The possibilities are endless, but what will it cost? Working out how much you will need to live the dream, and what you can afford will come down to a variety of factors. These include whether you own your home, the value of your superannuation and other investments, the return you earn on those investments and your spending patterns. You may also have a younger spouse who will be dependent on income from your investments after you die. And that’s the big unknown, because none of us know how long we will live. The challenge is to ensure your cash lasts the distance, however long that may be. You may retire at age 65 but your money needs to keep working to produce the returns you need to live out your days in the style to which you have become accustomed. A good way to begin thinking about your retirement needs and working out a budget is to visit the ASFA Retirement Standard, where you will find detailed budgets for different households and living standards.ii The budgets are updated quarterly and assume people own their own home. As at June 2018, the ASFA Retirement Standard calculated that singles aged around age 65 would need $27,425 a year to live a modest lifestyle while couples would need $39,442. A comfortable lifestyle would cost $42,953 for singles and $60,604 for couples. The comfortable budget allows for higher spending on things such as health, insurances, home improvements, clothing, eating out, entertainment and travel. To put this in perspective, the full age pension is currently $23,823.80 a year for singles and $35,916.40 for couples.iii As you can see, this does not stretch to ASFA’s modest budget, let alone a comfortable lifestyle, especially for pensioners who are paying rent or still paying off a mortgage on top of other expenses. Of course, everyone’s income needs and lifestyle will be different. Some people may need to spend more on their health, while a contented gardener and homebody may need less money than a keen global traveller with a season ticket to opera, theatre or football. 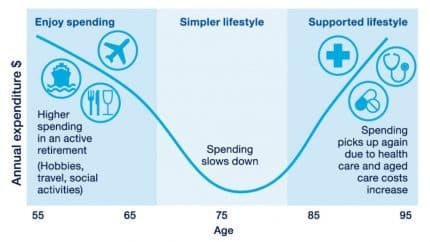 It’s also important to recognise that your spending patterns are likely to change in predictable ways over the course of your retirement, determined by your health and mobility. Most people go through three phases of retirement. The timing of each phase will be different for everyone, but the sequence is the same. The active years. Most Australians currently retire by age 65, although there is a growing trend to maintain some connection to the workforce on a part-time basis. Either way, in your 60s and 70s you finally have the flexibility to travel, spend time with the grandkids and pursue other interests. Expenditure is likely to be high, especially if overseas travel is high on your bucket list. You may also want to help your adult children buy their first home. Slowing down. At some point the joints get a little creaky and niggling health problems may emerge. As your mobility and activity decline so does your spending. Travel is closer to home, you may do some voluntary work and begin to live a little more frugally. Spending on health may increase and many will consider downsizing their home. The frail years. Most of us hope to remain in our own homes, but many will spend our final years in residential aged care. This may be due to increased frailty, a sudden medical event or cognitive decline. Whatever the reason, spending on health and aged care are likely to increase significantly during this phase. While government subsidies may reduce the out-of-pocket costs, having savings will increase your options and access to high quality care in your own home or an aged card facility. Australians are living longer, healthier lives which means many of us can expect to enjoy almost as many years in retirement as we did in the workforce. And that requires careful financial planning. Before you can set financial targets and investment objectives, you need to work out what your dream retirement might cost. 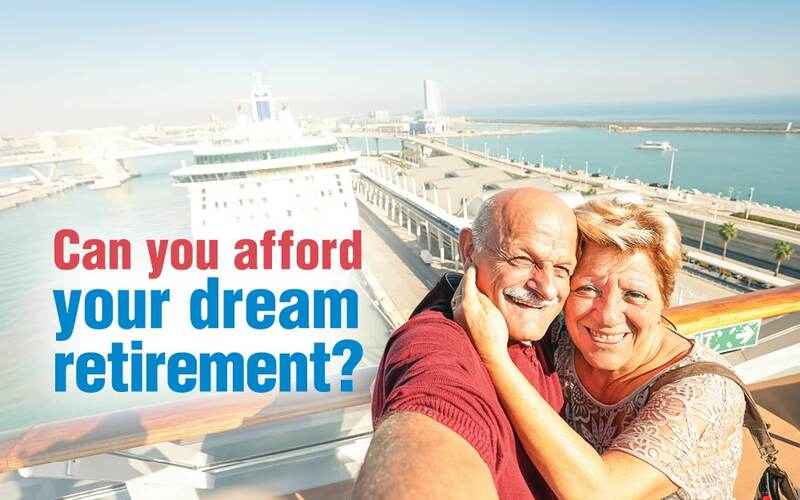 If you would like help to make your retirement dream a reality, give us a call.